Navigation is intuitive, user-friendly and customizable. Users are able to conveniently access related data from any object (tabs). The image below illustrates how data layers are presented and accessed through the Project page. Note the sections under the Project Detail page, e.g. Retrofit (measure installed or recommended), required data needed for rebates and Work Orders. Your system administrator has control over making the desired access point (the so-called related lists) for the whole organization or for particular users throughout the solution. Utility customer data is used as the base foundation of the energyOrbit solution. Data can be refreshed regularly and automatically. New customer and project data can be transferred to the utility CIS. Import, enter, maintain and track key account, premise (site) and contact information. Create and track information for customers, member agencies, vendors, contractors and other stakeholders. Data can be organized and tracked by account numbers, customer segments and category of information, contacts (property managers, trade allies, architects, etc.) and rate schedules. Create and track information for multiple physical premises or sites (properties), including optional parameters (building type, vintage, square footage, climate zone, etc.) that could affect energy savings calculations. Maintain a list of contacts within each account and/or site. With appropriate security and access, data for customers from various utilities can be incorporated into the program database. Rapidly create reports and dashboards using a powerful drag-and-drop reporting tool. Easily report and query key information in the database (e.g., program results vs. goal, spend vs. budget, project pipeline, savings by measure and measure type, and portfolio results). 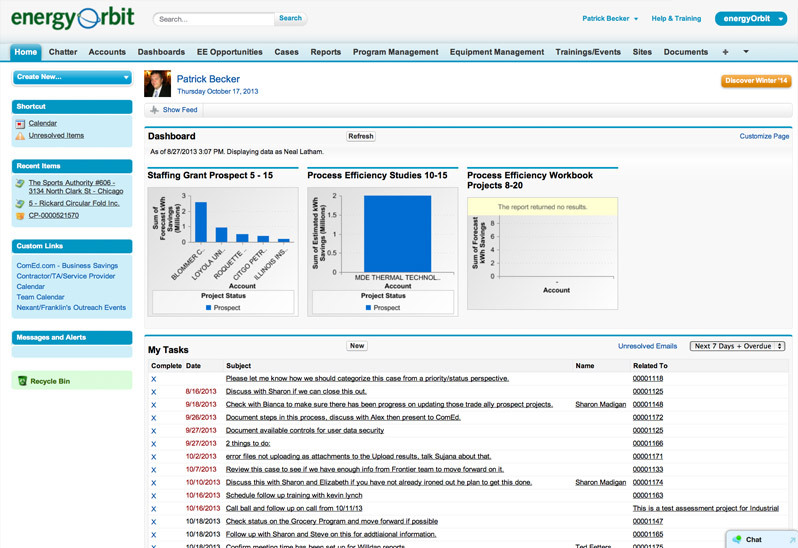 Display information graphically in reports and user/ organization dashboards. These dashboards are continually updated so top management, program managers, account managers, trade allies, or any other subdivision can see current program performance. Data restrictions are managed by the energyOrbit system administrator. Besides regularly scheduled reports, reports can also be automatically generated on an exception reporting basis for prompt review and corrective action. Non-technical users can set up reports and graphs in minutes. For more details on energyOrbit reporting capabilities, please click here. Manage customer and partner relationships. Maintain and view communication and activity history related to any account, contact, project or measure. Upload and maintain notes, attachments and documents. Assign and track tasks, which can be fully integrated with Microsoft Outlook or Lotus Notes. Customer and trade ally portal infrastructure is available. For more details on energyOrbit customer and trade ally portal and capabilities, please click here. Create formatted proposals based on program-specific template content. Create a new project, consisting of a set of suggested and/or implemented conservation measures, tracking of requirements, and tracking of the project through multiple, automated, customizable stages. This enhances the utilities' capability to deliver deep, comprehensive energy savings programs that can be delivered through a long-term energy efficiency savings plan developed by the customer. These energy plans are especially useful for large customers with long-term planning, budget constraints, internal competition for capital and budget cycles. Select applicable energy efficiency measures ("project retrofits"). Enter and confirm required additional information or qualification criteria. Track and automate project business processes and workflow. Set up new programs by entering descriptions, effective dates, conservation targets and budget. Easily copy or "clone" programs, including all or some of the related measures, requirements, etc., to quickly create new programs. Select applicable measures and set incentives. This also permits special promotion "incentive windows" to temporarily accelerate program savings to meet annual energy savings goals. Enter program requirements and additional required information (may be measure-specific). Optionally set up project/account caps, forecasting and duplicate prevention criteria. Duplicate prevention is provided at premise and customer levels, with criteria set for number of the same measure, number of similar measures over a specified period of time. When duplicate applications are submitted, automatic investigation will be initiated. Easily set up and maintain energy conservation measure (ECMs) costs and savings parameters. This data comes from state databases, the implementing contractors or program evaluators. Quickly enter and import a library of prescriptive measures, including ability to classify, set size and quantity, and enter variable savings parameters. Create custom measures, including the ability to calculate "hybrid" measure savings, where parameters are used in spreadsheet-like formulas to determine savings and/or incentives. Validate each step in the rebate process, reducing time to resolve application issues, improving your customer satisfaction.